We’ve all faced a blocked drain. Whether it’s a bathroom pipe, clogged toilet or kitchen drain, a blocked drain can and will occur. Blocked drains are no laughing matter. They can cause water leaks and potentially even a burst pipe depending on the severity of the clog. There are many causes for blocked drains, but also ways you can help prevent these blockages from occurring. Blocked drains often occur in the bathroom as hair, dead skin and other grime stick to soap scum built up on the sides of your drain pipes. This gunk builds up overtime and blocks the water from draining. There are a few ways you can try to clear your blocked bathroom drains. First, simply try to remove and clean your drain stopper or try using a drain plunger. If this doesn’t work, you can remove the drain elbow joint and clear it. Remember to clean your drain stoppers frequently and use a drain cover that catches hair to help prevent blocked drains. Blocked toilets are an unpleasant problem. The number one cause of blocked toilets is people flushing items down the toilet that cannot dissolve in water. Wet wipes, feminine hygiene products, cotton swabs, dental floss and other bathroom products should not be flushed down the toilet. When a drain blockage occurs, your first step should be to try using a plunger. The plunger works by forcing a push of water through to clear the pipe. If this simple method fails, you can try purchasing a hand auger. The auger reaches from 2 to 5 feet down the toilet’s drain pipe to break down the clog. Alternatively, you can use the auger to fish out items blocking the pipe. The best way to avoid a blocked toilet drain is to only flush toilet paper designed to easily dissolve in water. It’s also important to keep on top of cleaning. 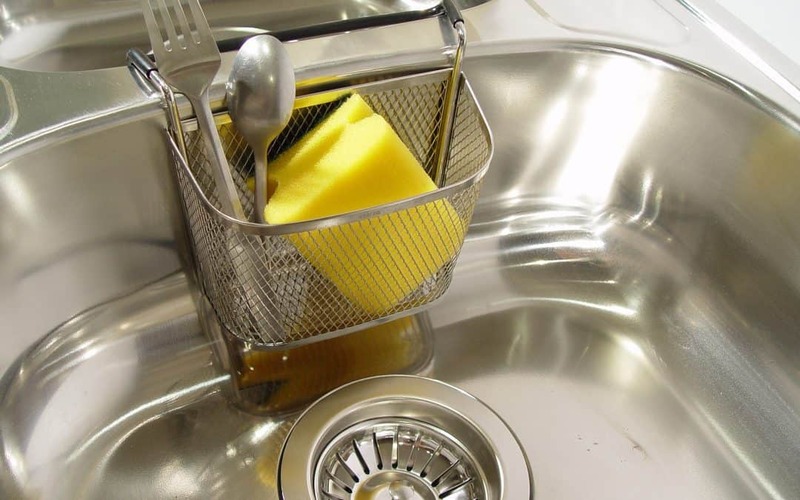 When we do the dishes, it’s easy to forget that the items we’re putting down our sink may block the drain. Gunk such as grease, oil, fat and stringy food are all drain blocking culprits. The food particles stick to the soap scum built up on the sides of the pipe, slowly causing a blocked drain. The first thing you should try to clear the blockage is to run hot water which should soften the clog. Then, send a little dish soap and more hot water down the drain. Let this settle, then try using a plunger and more hot water. If this doesn’t work, you can try using a chemical cleaner to clear the blocked drain. However, this is not the best method and should definitely not be a frequent solution. Harsh chemical cleaners are bad for the environment and can damage your pipes causing leaks. The best way to avoid having this issue is to let grease and oil cool and solidify instead of sending it down the drain. Afterwards, put the solid in a disposable bag or other seal-able container, and throw it in the garbage. If you have a very small amount of oil (less than a cup) you can clear it up with dish soap and hot water. This helps stop build up from occurring as the oil is already significantly broken down. What if My Drains Keep Getting Blocked? If you continue to notice blocked drains in your home, it may be time to have a professional service such as Clear Drain Cleaning evaluate the situation. The professionals at Clear Drain Cleaning can quickly assess any issues you’re experiencing and find a solution to clean your blocked drains. Clear Drain Cleaning is a local owned company that offers specialist cleaning methods such as hydrojetting and electric drain cleaning methods, along with camera inspections to insure we get it right the first time. Additionally, we service grease traps, septic systems, sewers and offer a root removal service. We proudly serve Holmes County, Wayne County, Tuscarawas County, Coshocton County, Stark County, Ashland County and Carroll County. Contact us today and Like Us on Facebook!